A small group prays at a makeshift memorial for victims of the Las Vegas massacre. Markie Henderson is grateful that her brother and sister got out of the Route 91 country music festival in Las Vegas alive. They were separated in the rush to escape the shooting, she says, but unlike hundreds of others, both got out physically unharmed. Henderson wonders what could motivate someone to fire into a crowd of people. "For the families that were affected, I'd want to know what happened to my brother or sister if it was one of them, for sure," she said. More than a week after a shooter took the lives of 58 people in Las Vegas, investigators are still without a motive. Experts say it's important to find one to give those affected closure and to prevent similar attacks in the future. Henderson, who lives in Las Vegas, came to the opening of a memorial garden built quickly last week by volunteers in of honor of the 58 people who were killed. Precy May Lawson, also from Las Vegas, came with handmade ornaments honoring each victim to place on a wall of remembrance at the park. She said the lack of answers takes a toll on the community. "There's so many questions, and we don't know the answer," she said. "Sometimes I'm just tired of asking the question that I don't have the answer, so I just leave it up to Him." With that, she pointed to the sky — to God, she said. "Right now we are just focusing on healing," Lawson said. Investigators, meanwhile, are looking everywhere for answer, talking to anyone who might have known the shooter. "As I've said from day one, we want to figure out the why ... and we'd like to know the motive," Las Vegas Sheriff Joe Lombardo told reporters on Monday. "That is our most important goal." It's important, says retired FBI agent and terrorism expert John Iannarelli, primarily in order to prevent future attacks. "We want to make sure that if there was something in particular that set this person off, or caused them to change their thinking, that will become an indicator in the future if somebody else engages in such behavior," he said. Iannarelli said this is a tough case, with no clear sign of a particular ideological motivation. Motives can also help point investigators to any potential accomplices, which authorities in Las Vegas continue to explore. "The motive may often lead to who may have helped inspire the activity, who may have helped even plan it or things of that nature," Scalora said. "So there still may be a legitimate law enforcement investigative purpose, regardless of whether the shooter is going to face justice in a courtroom." There's also often a psychological need to know, both for survivors — and the larger community. "It comes up a lot, because people just cannot believe that one human being would inflict this kind of violence and harm on another," said Priscilla Dass-Brailsford, a trauma psychologist and professor based in the Washington, D.C. area. She has worked with trauma victims after both natural disasters and violent attacks. Dass-Brailsford said it can be especially hard for people coping with violence to find answers. "When the person is not even available to explain why, it just makes it harder," she said. "What survivors really need sometimes is to get closure." 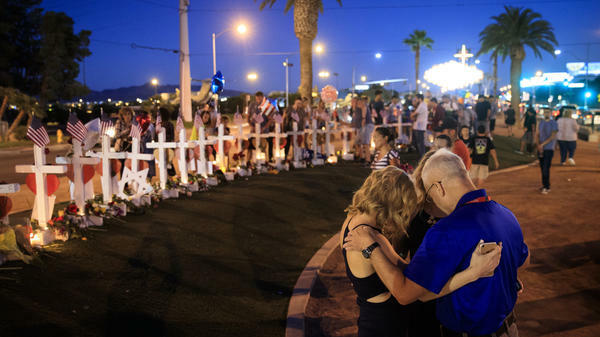 For others in Las Vegas, the focus on the question of what motivated the shooter feels like a distraction from the larger task of grieving the lost and helping the survivors. "The more time we give them, the less time we give the families of the people who have lost — for no reason," Karen Castle, of Las Vegas, said as she stood near the memorial wall at the garden opening. Dany Feinstein of Ely, Nevada spent years in Las Vegas. She returned to pay her respects. "There is no reason to do something like this. There is none," Feinstein said. "... I don't think it matters, other than if it could help prevent something in the future." Still, investigators say they're hopeful they will find a motive — if for no other reason, than to help reduce the chances of yet another deadly attack.